LONDON, England (CNN) -- UK businesses, already hurting from a recession, were counting the cost Monday of the country's worst snowstorm in almost two decades, as a crippled transport system left commuters stranded, offices semi-deserted and airlines grounded. 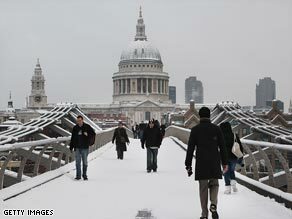 Pedestrians cross the Thames in front of St Paul's Cathedral in London's financial district. At least 20 percent of the workforce nationwide, or 6.4 million employees, failed to make it into work Monday morning, according to an estimate by the Federation of Small Businesses. But the figure was estimated to be far higher -- around 40 percent -- in London and southeast England, which is home to around a fifth of all British businesses. "It's pretty bad out there and throughout the whole of the UK," Alambritis said. "The blow to the economy should be lightened by the fact that people can work via internet and laptops. But what we are seeing is economic activity reduced, contracts not being signed, invoices not being sent out and meetings being canceled." iReport.com: Are you snowed in? Douglas McWilliams, Chief Executive of the Centre for Economics and Business Research warned that up to 3,000 businesses could go bankrupt as a result of short-term cashflow problems caused by the weather. "Many of the businesses that are close to failing are in the retail and construction sectors that are likely to be most affected by the snow and transport disruption," McWilliams said in a statement. Alambritis said that the disruption would also damage the UK's reputation as a place to do business and called for the government and local authorities to invest in infrastructural improvements to cope with freak weather. "It gives the UK a bad name if there's a bit of snow and the whole economy grounds to a halt," he said. "Why is it that in Canada, New Zealand and Scandinavia they have these snowfalls and everything carries on?" In the City, financial markets were running at 50 percent capacity in early trading with just 120 million shares changing hands by 0910 GMT, according to David Buik of BGC Partners. But a spokesman for the London Stock Exchange told CNN later that trading had not been too badly affected, with most trading automated at the big firms. Airlines were expected to be particularly badly hit with hundreds of flights canceled or severely delayed from airports in the southeast as Heathrow and Stansted were forced to shutdown runways. Budget airline Ryanair, which operates out of Stansted, canceled more than 100 flights and said stranded passengers could book a new flight free of charge. But some businesses were enjoying an unexpected boost from the chaos. With bus and rail links down across London, taxi firms were reporting surging demand. Keith Cain, the control room manager for Dial-a-Cab, the city's biggest taxi company, said the firm had been receiving more than 5,000 calls an hour, mostly from companies trying to get their employees to their desks. Hotels near Heathrow Airport also reported being overwhelmed by stranded passengers seeking rooms for the night.